This bloomer-and-dress style was popular from about the 1880s to about 1920. The vaguely empire lines of this model are consistent with dress styles of the mid teens. The June 6th, 1915, the New York Times included a wonderful article about the season's styles in bathing suits. Which starts off "probably the majority of women who love the surf will bathe this Summer, as in other Summers, in suits of black or blue." But in 1915, brightly colored silks were popular. Bathing shoes came in both high boot styles, such as our model is wearing, and low slipper styles. My edition of The Women's Institute booklet Miscellaneous Garments, copyright 1917, recommends making bathing suits of "Flannel, serge, alpaca and similar woolen materials..." The author states that a successful bathing suit "should be generously full, though not baggy nor clumsy." Proper headgear is important. 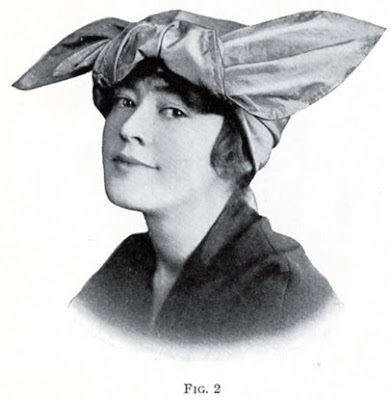 According to the New York Times, rubber bathing caps were decorated with rubber flowers, and in 1914 it became fashionable to wear corsages of these rubber flowers in colors to match or harmonize with one's bathing suit. According to The Women's Institute, over a snug-fitting rubber cap, one wears "...a cap of lightweight material that harmonizes" [with the bathing suit.] Also "...by observing the instructions given for house or boudoir caps...no difficulty will be encountered in developing them." The cap that our model is wearing is very much in the boudoir cap mode. One thing of interest I noted, the pattern appears to be for multiple sizes? Am I correct? I have never seen this in older patterns before. Was this an uncommon feature? Interestingly, some of the current crop of modest bathing suits are very much like this old style, proving yet again there is nothing new under the sun. The sizing printed on the envelope is a little confusing, and the edge of the envelope has crumbled away, making it even more obscure. This pattern is in one size only, for a 36 inch bust, which I suspect is the "Medium" size. It's beautiful! I love old-fashioned bathing suit! Do you have this pattern? I'd love to see more details of its construction, I'm planning to make some early bathing suits and try them out this year. Yes, this is a pattern that I own, and this is just about all the information on it. There is no separate sheet of instructions and the layout is not printed on the back of the envelope, sorry.